The Food Pantry is open twice a month to distribute food to people and their pets who are in need. Donations of non-perishable food items such as cereal, peanut butter, canned meats, pasta, canned vegetables, soups, red sauce and cat and dog food can be dropped off 24/7 to our donation bins located under the portico near the church office doors. Monetary donations are welcome and checks can be made out to and mailed to St. Agnes’ Episcopal Church, please put Food Pantry in the memo line. You can also donate online but using the following "Donate" button. Please help us to help others. The Food Pantry opened in July of 2012 in response to people not being able to feed themselves and their pets. The Food Pantry is open twice a month to distribute food to people and their pets who need supplement food. We are in need of donations of non-perishable food items such as peanut butter, pasta, canned fish and ham, red sauce, mayonnaise, cereal, beans, canned vegetables and cat and dog food. 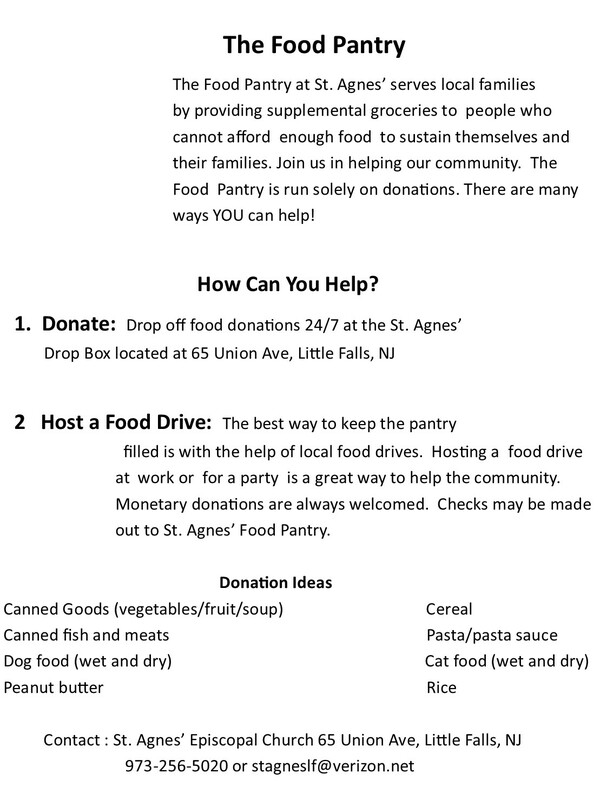 The food items can be dropped off 24/7 to our donation bins located under the portico near the church office doors. Monetary donations are also accepted: please make checks to St. Agnes' Episcopal and put "Food Pantry" in the memo line. The Food Pantry is a community effort to help feed the hungry. Volunteers are welcome. Please call the church office should you have any questions.